The Minnesota Streetcar Museum (MSM) is a transport museum that operates two heritage streetcar lines in Minneapolis, Minnesota and the western suburb of Excelsior. The Museum was created as a result of the restructuring of the Minnesota Transportation Museum (MTM) during the winter of 2004-2005. The MTM was founded in 1962 to restore a streetcar, Twin City Rapid Transit Company No. 1300, that had been operated by the TCRT until the last streetcar lines were abandoned in favor of buses in 1954. Over time, the Museum diversified to include diesel and steam-powered trains, buses, steamboats and associated buildings, papers and photographs. When the MTM was restructured during the winter of 2004 and 2005, the Minnesota Streetcar Museum was created and assumed ownership and operating responsibilities of the two streetcar lines. The Museum of Lake Minnetonka was also created as a result of the split and assumed ownership and operating responsibilities of the restored Steamboat Minnehaha, which was built by TCRT in 1906. The Minnesota Streetcar Museum now has five operable streetcars, three from TCRT's fleet and two from the Duluth Street Railway Company. A streetcar from Winona, Minnesota is currently under restoration while a Fargo-Moorhead Birney streetcar and a Mesaba Railway inter-urban car await restoration. In 1971 the MTM began operations on the Como-Harriet Streetcar Line, a heritage streetcar line in Minneapolis, Minnesota. The mile-plus-long Line runs along the original TCRT streetcar right-of-way between Lake Harriet and Lake Calhoun and is open to the public. Three restored streetcars formerly used by TCRT are used and the Museum has built a replica 1900 station at the intersection of Queen Ave and 42nd Street. The Excelsior Streetcar Line began operation in 1999 in west-suburban Excelsior near Lake Minnetonka using Duluth Street Railway Company No. 78, transferred from the Museum's Como-Harriet Line. TCRT No. 1239 joined No. 78 in 2004. The Line is operated on the former Minneapolis and Saint Louis Railway right-of-way now used by the Hennepin County Regional Railroad Authority as a bicycle trail. All trips feature a tour of the Excelsior Carbarn, where Winona No. 10 is currently being restored and Mesaba No. 10 stored awaiting restoration. Returned to service in 1991 after a seven-year restoration, Duluth Street Railway Company No. 78 is the oldest streetcar in the Museum, having been built by LaClede Car Company of Saint Louis, Missouri in 1893. The car, which was retired in 1911, is one of the oldest working streetcars in the country. It is a first-generation electric car that resembles the horse-drawn streetcars which it replaced. It has been operating on the Excelsior Streetcar Line since 1999. TCRT No. 1239 was built at the 31st Street Shops in Minneapolis and has been restored to the configuration it had when it was constructed in 1907 with a private door to the motorman's cab in the front and double (later triple) stream wire gates for passenger access in the rear. This configuration required "two-man" operation, with a motorman in front who operated the streetcar, including opening and closing the gates, and a conductor at the rear who collected fares and helped with backing when necessary. Many TCRT streetcars were converted to one-man/two-man operation in the 1930s by adding double-stream folding front doors and replacing the rear gates with similar doors. This gave TCRT the option to operate the car with only a motorman ("one man" operation), or, on busier routes, with a conductor and a motorman ("two man" operation). Because streetcar ridership remained high on many routes until the end of service in 1954, many "gate cars" with single-stream front folding doors remained in service until the end. TCRT No. 1239 returned to service in September 2004. ^ "Fact Sheet". Minnesota Streetcar Museum. Archived from the original on June 23, 2016. Retrieved August 13, 2016. Wikimedia Commons has media related to Minnesota Streetcar Museum. Excelsior is a city on Lake Minnetonka in Hennepin County, Minnesota, United States. As of the 2010 census the population was 2,188, and in 2016 the estimated population was 2,316. The suburb is located 18 miles (29 km) west of downtown Minneapolis. The Newark Light Rail (NLR) is a light rail system serving Newark, New Jersey operated by New Jersey Transit Bus Operations. The service consists of two segments, the original Newark City Subway (NCS), and the extension to Broad Street station. The combined service was officially inaugurated on July 17, 2006. Streetcars in New Orleans have been an integral part of the city's public transportation network since the first half of the 19th century. The longest of New Orleans' streetcar lines, the St. Charles Avenue line, is the oldest continuously operating street railway system in the world. Today, the streetcars are operated by the New Orleans Regional Transit Authority (RTA). The Twin City Rapid Transit Company (TCRT), also known as Twin City Lines (TCL), was a transportation company that operated streetcars and buses in the Minneapolis-St. Paul metropolitan area in the U.S. state of Minnesota. Other types of transportation were tested including taxicabs and steamboats, along with the operation of some destination sites such as amusement parks. It existed under the TCRT name from a merger in the 1890s until it was purchased in 1962. At its height in the early 20th century, the company operated an intercity streetcar system that was believed to be one of the best in the United States. It is a predecessor of the current Metro Transit bus and light rail system that operates in the metro area. Nicollet Avenue is a major street in Minneapolis, Richfield, Bloomington, and Burnsville, Minnesota. It passes through a number of locally well-known neighborhoods and districts, notably Eat Street in south Minneapolis and the traffic-restricted Nicollet Mall in the city's downtown. The Minnesota Transportation Museum is a transportation museum in Saint Paul, Minnesota, United States. The Como-Harriet Streetcar Line (CHSL) is a heritage streetcar line in Minneapolis, Minnesota, which follows original streetcar right-of-way between Lake Harriet and Bde Maka Ska and is operated by the Minnesota Streetcar Museum. The heritage line was originally developed in the 1970s by the Minnesota Transportation Museum which spun off streetcar operations in the winter of 2004-2005. Thomas Lowry was a lawyer, real-estate magnate, and businessman who oversaw much of the early growth of the streetcar lines in the Twin Cities area of Minneapolis, St. Paul, and surrounding communities in Minnesota. He became head of the Minneapolis Street Railway Co., later to become part of Twin City Rapid Transit (TCRT). Old Pueblo Trolley is a non-profit, educational corporation based in Tucson, in the U.S. state of Arizona, that is dedicated to the preservation of Arizona's mass transit history. 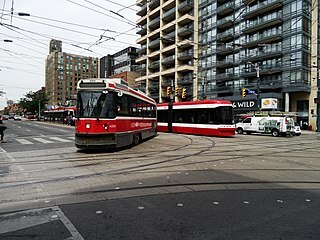 The name also commonly refers to the heritage streetcar line which OPT began operating in 1993, on which service is currently indefinitely suspended. OPT consists of three divisions that each fill a specific role in preserving the state's mass transit history. The divisions are the Street Railway Division, Motor Bus Division and the Museum Division. 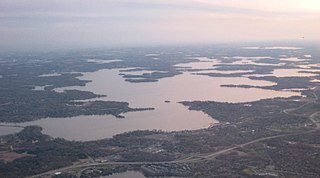 Big Island Park was a popular tourist destination that existed near Minneapolis, Minnesota between 1906 and 1911 on Lake Minnetonka's Big Island. Today the property is a municipal nature park owned by the City of Orono. Transportation in the U.S. State of Minnesota consists of a complex network of roadways, railways, waterways and airports. The transportation system is generally overseen by the Minnesota Department of Transportation, a cabinet-level agency of the state government. Additionally, regional governments such as the Metropolitan Council have authority over regional planning for the transportation system and local governments such as cities and counties oversee the local transportation network. Market Street Railway is San Francisco Municipal Railway's (Muni) 1,200-member nonprofit preservation partner. It relies on private contributions to help maintain San Francisco’s fleet of historic streetcars in service on the E Embarcadero and F Market & Wharves lines and the national landmark cable cars. The Arrowhead was a daily passenger train operated by Amtrak between Minneapolis, Minnesota and Superior, Wisconsin in the United States. After two years of operation, service was extended from Superior to Duluth, Minnesota. The Lyndale Railway Company later renamed the Minneapolis, Lyndale, & Minnetonka Railway Company operated the Minneapolis, Lyndale and Lake Calhoun railway, also known as the Motor Line.